VILNIUS, Lithuania Europe's finance ministers are working against the clock to solve the thorny but crucial issue of agreeing on further reforms to strengthen the region's banking sector. Decisions on securing Europe's economy will be put on hold in a few months as the region gears up for the elections to the European Parliament in May. "It's very important that we stick to that timeline," said the Netherlands' Jeroen Dijsselbloem, who chairs the meetings of finance ministers from the 17 European Union countries that use the euro currency. 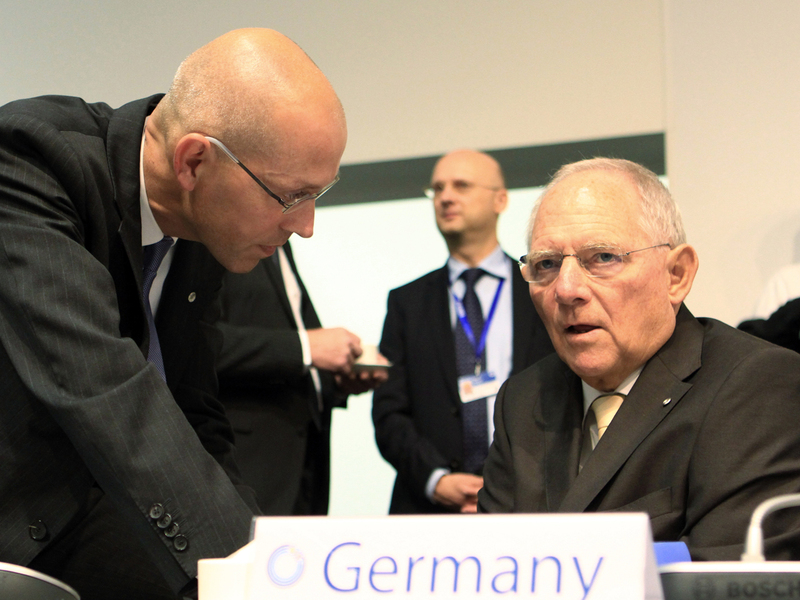 Governments must strike a compromise on the complex legislation by December, Dijsselbloem added. If they fail, the legislation won't be able to clear all necessary hurdles before the European Parliament descends into full-time campaign mode in April. But the Eurogroup meeting in Lithuania Friday on setting up a single body to restructure or unwind bust banks quickly hit a wall as the European Central Bank clashed head-on with Germany, the bloc's biggest economy. The euro countries have already agreed to set up a centralized bank oversight to be anchored with the European Central Bank, legislation for which was passed by the European Parliament Thursday. Setting up the next step to deal with bust banks -- the so-called single resolution mechanism -- is seen as crucial to completing the banking union, which analysts bill as Europe's most important initiative in turning the tide on the bloc's three-year-old debt crisis. The banking union's goal is to make the supervision and rescue of banks the job of European institutions rather than leaving weaker member states to fend for themselves. Failing banks in the past have dragged down government finances and forced European Union countries such as Ireland or Cyprus into seeking bailouts. Most countries -- including the bloc's weaker southern economies but also France -- are pushing for a powerful centralized authority complete with a common financial backstop to deal with bank failures. Germany, in turn, argues the EU's current treaties aren't a sufficient legal basis for such an authority. Instead, it proposes stronger cooperation between existing national watchdogs followed by a limited change of the EU treaties -- something that could take years. ECB executive board member Joerg Asmussen insisted the legal experts of the European Commission, the Council of ministers representing the governments, and the European Central Bank agreed the current treaties were sufficient. "This in our view is the biggest integration step in Europe since the introduction of the common currency," he said, insisting on swift progress in implementing the bloc's planned banking union. "Now we can move on and we should move on with the second key element of the banking union." Before it takes on its new role as banking supervisor, the ECB will carry out a very tough assessment of the banks' balance sheets. "The importance of this exercise can be hardly overestimated," Asmussen said. "It provides an extraordinary and overdue opportunity to create transparency of bank balance sheets in Europe and is necessary to repair these bank balance sheets." The finance ministers on Friday also agreed to release a 1.5 billion euro ($2 billion) tranche for Cyprus. The eastern Mediterranean island nation was granted 10 billion euro bailout in March after being shut out of bond markets in return for radically overhauling its banking sector. The finance ministers also urged the tiny alpine country of Slovenia, which is similarly burdened by ailing banks and is viewed by some analysts as next in line for a bailout, to push ahead with restructuring its banking sector. Slovenia insists it won't need a bailout.